LOUISVILLE, Ky. – Florida State opened its 2019 campaign with five wins to remain No. 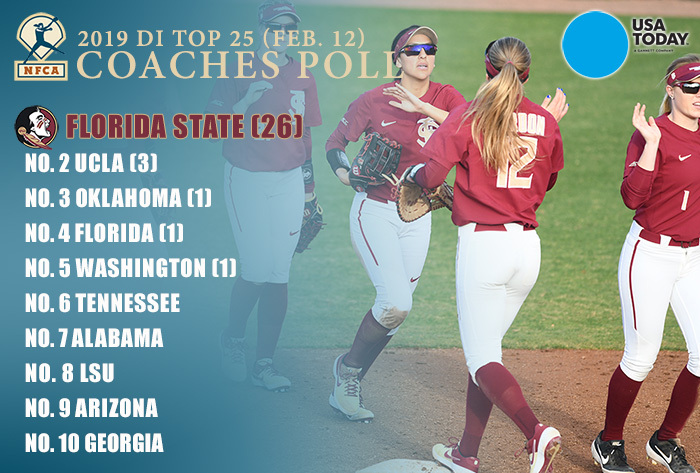 1 in the first USA Today/NFCA Division I Top 25 Coaches Poll of the season. The defending champs received 26 of a possible 32 first-place votes and 787 points. The Seminoles (5-0) are one of nine top-10 teams to sport an undefeated record after the first weekend of play. After surrendering two runs in the season-opening win over UNCW, the Seminole pitching staff recorded four shutouts against Iowa State (2), UNCG and UNCW, including a combined no-hitter by newcomers Kara Bilodeau and Makinzy Herzog in the finale. No. 4 UF picked up two signature wins in its 5-0 start. The Gators knocked off then-No. 19 Michigan, 6-0, and then-No. 7 Arizona, 3-2. They also posted victories over Illinois State, North Carolina State and host RV USF. The Huskies slipped to No. 5 after opening with a 4-1 mark in Puerto Vallarta, Mexico. Washington opened with a 9-1 win over North Carolina, but suffered its first setback in a 3-2 eight-inning loss to RV Notre Dame. The Huskies bounced back with triumphs over Duke, RV Liberty and then-No. 18 Baylor.